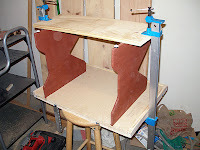 In Part 1 I wrote about laminating the melamine and particle board, and building the stand. 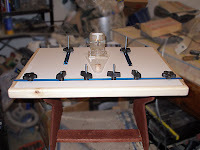 Here I'll talk about the finishing the stand, installing Rockler's T-Track (at the time of this writing, the kit with bolts and knobs is on sale for $10.99. I paid $21.99...), edging the top, and putting everything together. In Part III I'll go into the router mounting, cleats for wall mount storage, and the fence. Once the glue dried, I gave the particle board legs and the pine stretcher a thorough sanding. I had a can of Deft "Step Saver" in Cherrywood that I've had so long I don't remember buying it. At least 15 years... Ugh. I need to get rid of this stuff. 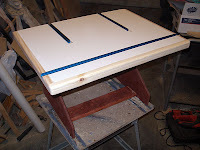 I applied it to every surface except the tops of the legs that will be glued to the table top. I taped those off. But it didn't matter. BORG (Big Orange Retail Giant) particleboard is crap. It was so porous that the stain/finish soaked right through. Sanding just revealed more stained particle board. So I let it dry a bit more with the help of a heat gun. While that was drying, I turned my attention to the top. I attached the front facing edgine (a 1x2" piece of BORG "select" pine) and realized I didn't have enough for the sides. Whoops. Poor planning on my part. Off I go to Lowe's (I needed some hardware for a picture frame for my daughter too). I get a 6ft length of Lowe's "Select Pine" 1x2". I also bought the hardware and a big chunk of UHMW (Ultra High Molecular Weight) plastic sold as a tapping block. It was on the clearance rack for $5, normally $13. Of course, Lowe's being Lowe's, when I got home I discovered they had charged me the full price. CRAP! When I drove back they said they couldn't just credit my card with the difference, but instead had to credit the whole amount, then I had to buy the thing again. My card was close to the limit so that wasn't an option for me. (And the cashier argued with me.) I decided to just get the refund and walk away. Anyway, when I got home I discovered a few things. Home Despot's "Select Pine" is nowhere near as nice as Lowe's pine with the same designation. Lowe's was slightly larger in all dimensions, it was a lot smoother and denser, it was free of knots, and the grain was darker. These two stores are 12 miles apart so I doubt it is a regional issue. Just a big difference in quality. This bothered me since the front and sides wouldn't match. I can sand down the size differences, but the colors wouldn't match. As it turns out, the difference after sanding them both wasn't too bad. Plus I kinda like the single knot on the front. I attached them with dowels and Titebond Original Wood Glue. It also used up the last of my bottle. I need to go to the store! I used a scrap piece of the T-Track as a plane inside the dado to smooth out the bottom. It worked surprisingly well at this task! I discovered another poor planning issue though. Stopped dadoes need to be squared off. Whoops. I don't own a chisel! Or anything else that would work that I could think of. So there is a little dado ramp at the forward ends of the fence T-Tracks until I have the money to buy a chisel and sharpening stuff. I set the T-Tracks in the dadoes. The fit was tight (as intended) and I rapped them into place with a wood block and light taps with a hammer. 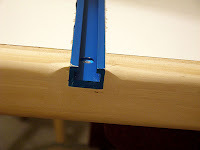 I have one minor gripe about the Rockler T-Track. Not enough mounting holes! I ended up with only 2 holes in the long jig track, and one in each of the fence tracks. I'll have to drill new holes and chamfer them out myself at some point. For now we'll see how stable it is if left alone. I then used my Harbor Freight 1/4" trim router with a 1/2" round over bit to round the top and bottom edges of the pine, as well as the corners. I skipped past where the T-Track ends were exposed, as the picture shows. Then a quick sanding with the melamine taped off. For the last picture, I put all the bolts and knobs that came with that T-Track kit. I really like this stuff. I've already got some pretty slick fingerboard sketches waiting for me to finish this table. Also in that picture, you can see my router's base mount and the offset base I made for it. I had originally planned on using that offset base as the table plate so I could just drop the router in when I want to use the table. But as you can kinda see in this pic, it would remove a LOT of material from the top. That means a weaker top. I've decided to go with something a little more standard. Either making a plate from more acrylic, or (gasp!) buying an aluminum plate and making my own holes. Part III will have more discussion on this topic.